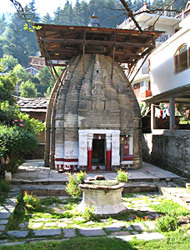 A unique temple with a pyramidal shaped sanctum sanctorum. Apart from this temple has no other structures as is usual to temples in the region. The idol of Lord Vishnu, on a raised-square platform, is Chatur Bahu- that is four-handed one.